BUENOS AIRES, Nov. 30 (Yonhap) — U.S. President Donald Trump on Friday reaffirmed his commitment to a second summit with North Korean leader Kim Jong-un, while apparently offering his blessing to Kim’s scheduled trip to Seoul. In a bilateral summit with South Korean President Moon Jae-in, the U.S. president noted Kim’s Seoul visit may create new momentum for efforts to denuclearize North Korea and establish peace on the Korean Peninsula. “While affirming his commitment to holding a second North Korea-U.S. summit early next year, President Trump asked that South Korea and the U.S. closely cooperate so the next summit will be another historical milestone in the process of denuclearizing the Korean Peninsula,” Moon’s top press secretary, Yoon Young-chan, said of the summit on the sidelines of the Group of 20 meeting. Trump first met the North Korean leader in Singapore in June. ㅍHeading into his sixth bilateral meeting with Trump, the South Korean president was widely expected to seek U.S. understanding for an additional round of inter-Korean summit before Trump’s second meeting with the North Korean leader. Kim earlier agreed to visit Seoul before the year’s end to reciprocate Moon’s trip to Pyongyang in September. His trip, if made, will mark the fourth meeting between the leaders of the divided Koreas, which technically remain at war. Trump appeared to have offered his blessing for the fourth Moon-Kim summit. “The two leaders agreed Chairman Kim Jong-un’s visit to Seoul would provide an additional momentum to their joint efforts to establish peace on the Korean Peninsula,” Yoon told a press briefing in Buenos Aires. 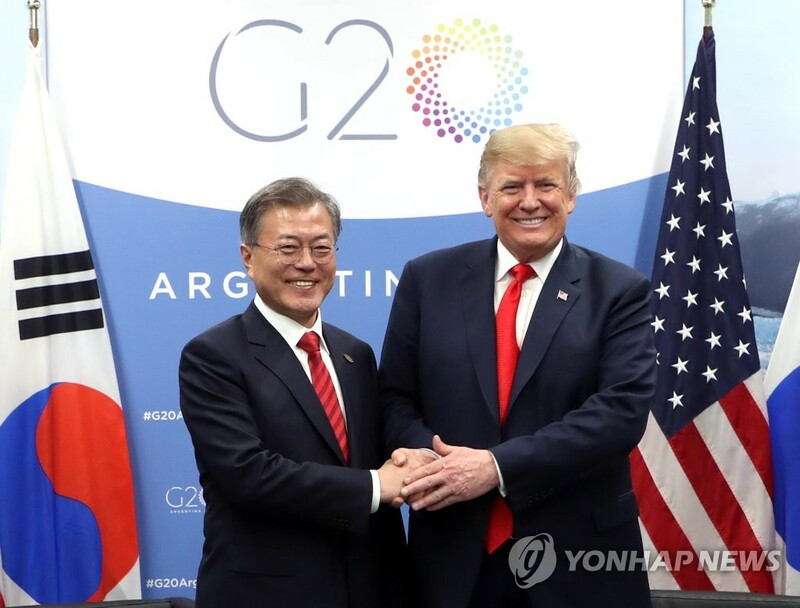 A senior official from Moon’s presidential office, Cheong Wa Dae, later insisted Trump must have been aware of Seoul’s wish to hold the fourth Moon-Kim summit before the year’s end as promised. The leaders of South Korea and the U.S. noted their efforts to denuclearize the Korean Peninsula have been and are moving in the “right direction,” Yoon told the press briefing. They also stressed the need to maintain pressure on North Korea until the communist state completely denuclearizes. “The two leaders agreed that it is important to maintain existing sanctions until North Korea reaches complete denuclearization,” Yoon said. The White House highlighted the importance of keeping sanctions intact. “The two leaders agreed on the importance of maintaining vigorous enforcement of existing sanctions to ensure the DPRK understands that denuclearization is the only path to economic prosperity and lasting peace on the Korean Peninsula,” it said in a released statement. DPRK stands for North Korea’s official name, the Democratic People’s Republic of Korea. Moon praised his U.S. counterpart for playing what he called a “pivotal role” in progress so far in the peace process on the Korean Peninsula. Trump, too, highly evaluated the South Korean leader’s role in creating a favorable environment for denuclearization of the Korean Peninsula by easing military tensions. Friday’s meeting between Moon and Trump marked the sixth of its kind since Moon took office in May 2017.